Our site specific piece, Communion, located at the Drill Hall, will be a one-to-one fifteen minute performance (repeated over five hours), taking place from 12:15pm – 5pm, on May 4th 2016. The piece will display the Drill Hall’s history as an army training base in World War I (WWI), linking the sites previous use with its current function as a theatre. This will be achieved by creating an installation based performance in ‘The Room Upstairs’ (TRU), which was used as a Men’s Club during the War. Wine bottle outline, from Anthony (2016). The installation will consist of empty wine bottles, creating the outline of a wine bottle. This will represent the volume of wine consumed in the Drill Hall since its creation, thereby constructing ‘interpenetrations of the historical and the contemporary’ (Pearson, 2010, 25) uses of the site. Initially we utilised the practice of ‘drifting’ from Phil Smith’s Mythogeography (2010, 118) allowing us to view the space without focusing on the Drill Halls’ psycho-geography as a theatre, aiming to eliminate our preconceptions of TRU as small studio space. Through our initial session ‘drifting’ we noticed a preserved section of wall in TRU, stained with nicotine. This ‘non-space’ is evidence of the Men’s Club, which we aim to highlight during our performance. Nicotine-stained wall, from Anthony (2016). The piece will begin with myself meeting the participant at the front desk. They will be invited to wear a blindfold, before being guided into the ground floor lift. They will be taken up to TRU, located on the second floor. Inside the lift I will reference the memorial plaque in the café, adjacent to the front desk, through the dialogue “to the glorious dead”. We will incorporate the text from the plaque in order to make the participant aware of the specific history we are representing through our piece. The participant will be guided through the installation and seated at a table opposite the second performer. The performer will interact through dialogue referring the Men’s Club, derived from text acquired when researching into the site’s history at the Lincolnshire Archives. During this section the second performer will also reference the nicotine-stained wall and raise a toast “to the glorious dead”, reaffirming the association with the sites past. The aesthetics of our installation was considerably inspired by Reckless Sleepers’ The Last Supper (2004), encouraging our decision to include a table in the centre of our installation, which we believe will also focus the audience’s attention during the piece. 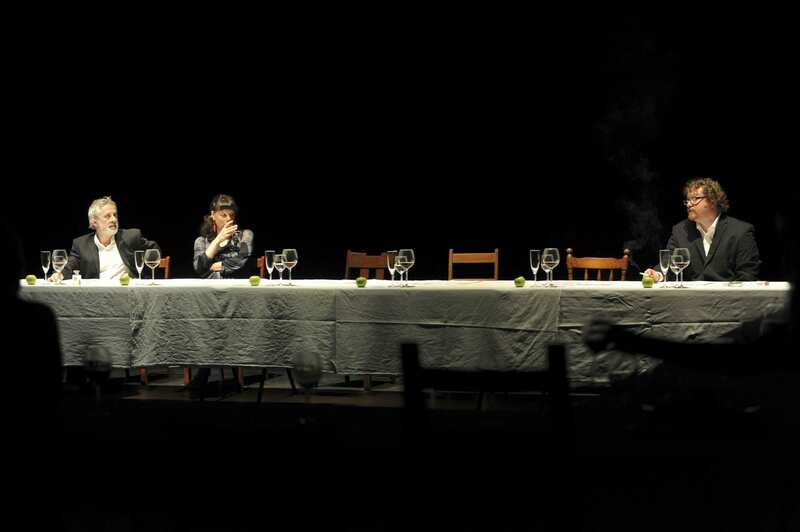 Reckless Sleepers’ The Last supper, from Löhr (2014). 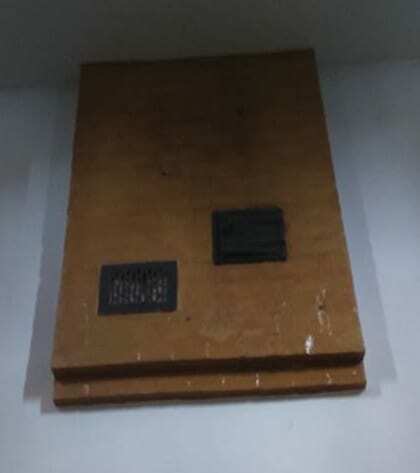 The participant would finally be guided to the third performer, who will mix materials associated with the site’s history (grapes, wine and earth procured from ‘the Common’: another previous army training base), at a table positioned underneath the nicotine-stained wall. The audience will be invited to wash the third performer’s hands in the toilet, drawing attention to another ‘non-space’. This intimate interaction will end with the third performer giving the participant a chocolate coin (representing the investment in the Men’s Club, referenced in the second performers dialogue), with the exclamation “to the glorious dead” reinforcing the association of the space’s history. Finally the participant will be directed down the stairs, competing their journey by leading them back to where they were collected from. For our performance we chose use TRU, with the spaces aesthetics initially interesting me, before I fully understood the how the room’s history could enhance our piece. ‘Approx. 7.25m x 14.5m […] Located on 2nd floor but with both lift and staircase access […] In built lighting rig, digital projector and screen, sound system’ (Lincoln Drill Hall, 2016). The technical facilities located in the space intrigued our group, however, we realised that viewing the room solely as a studio space, generated too many ideas which were inherently theatrical. Therefore, we aimed to ignore the spaces technological capabilities so that we could focus on generating ideas from the history of the space. Initially we followed exercises in Phil Smith’s ‘Handbook of Drifting’ from Mythogeography: a guide to walking sideways (2010, 118), to help us explore the space in different ways. As a result, our group identified some ‘non spaces’ (which first went unnoticed to myself), including the small kitchen and toilet a-joined to TRU. At first I found the exercises difficult to maintain, because walking without purpose was a foreign concept to me. However, after persevering, I found the task beneficial in helping us identify the ‘non spaces’ we could use to detract attention away from TRU’s ‘obvious performance space’, below the lighting grid. From our initial visits to the Drill Hall, we also learnt that TRU is occupied Wednesday mornings from 9.30am- 12pm for Hartbeeps: baby and toddler classes. After learning of the room’s current use, our group wanted to juxtapose this with a contrasting function from the spaces’ past. We believed this would allow us to create an interesting installation, merging two contrasting histories. A member of staff from the Drill Hall suggested the existence of a Men’s Club (during its time as an army training base in WWI) in the TRU. The evidence for this claim was the preserved section of nicotine-stained wall in TRU. Documents at the Lincolnshire Archives confirmed the existence of the Men’s Club in TRU, with several references to the room’s use in old budget meetings. Documents from Lincolnshire Archive, from Anthony (2016). Our initial ideas for an installation included whisky tumblers filled with milk, and milk bottles filled with whisky or wine, in addition to piles of fake money (possibly being distributed to the audience) linking to the documents found at the archive describing the investment into the Men’s Club. However, we put aside the idea of representing the money spent, soon after the idea was generated as we had little idea of how this transaction would benefit our interaction with the audience. It was at this point in our creative process we decided to focus on the role of the audience. This was done in addition to discussing the possibility of including an element of live performance, to aid their progression through the piece. We discussed facilitating our installation by acting as waiters, guiding the audience whilst serving them. Although we soon realised this idea was formulated without particularly considering how the interaction would enhance the piece, and feedback from our lecturer suggested that the characters did not fit with our ideas for the installation. After this feedback we decided to research into theatre companies that produced site specific work, to get a clearer idea of how to guide the audience, without adopting characters. Etchells believes the contract between audiences and actors is reciprocal, supporting the idea that ‘[the] public is an active agent and theatre doesn’t exist until […] they […] are engaged’ (Pearson, 2010, 37). This allowed me to consider how a direct address to the audience, without creating a character could be a viable means of guiding an audience member through our piece. We believed this guidance with limited interaction could also allow the audience to focus on the aesthetics of the installation rather than the performance element. Furthering my research into actor-audience relationships, I looked into Mike Pearson’s Site Specific Performance (2010). Pearson’s notion that ‘the audience may be incidental… and obdurate’ (Pearson, 2010, 17) during site specific pieces prompted me to reconsider how the contract between actors and audiences alters from that of a theatre production. Following this research, which reminded me of the change in perspective required for site specific pieces, we looked into using a direct address in the form of live interaction. This would allow us to guide the audience and raise awareness of the history we were wishing to portray through speech devised from the documents found at the archives, without creating too much of a theatrical experience. Through further discussion of these emerging ideas we realised that the live interaction could risk distracting from the installation. However, after research into Reckless sleepers, and their performance of The Last Supper (Reckless Sleepers, 2004), we took inspiration from the visual aesthetics of their piece, and decided to have a table in the middle of our installation. We believed this idea would allow the audience member to focus on the installation before sitting down, and shift their focus to a performer that could be sat opposite them once they choose to be seated. We also discussed the dangers this could have for the performance, as ‘[p]articipation in the performance event often triggers spontaneity, improvisation […] and risk and requires trust […] and a willingness to partake’ (Zerihan, R, 2009, 3). Therefore, we decided to only bring one audience member into the piece at once, creating a more intimate performance, with less audience members to guide and control. After meeting with our module co-ordinator, we decided to refine the concept of our installation, to represent only the volume of wine consumed in the Drill Hall during its past and present uses. We began collecting empty wine bottles from local bars and restaurants, with the aim to fill TRU. After collecting 254 bottles we displayed them in our space to see how much of the room we could fill with this amount alone, to give us an indication of how many more we would need. After this we discovered there would not be enough to fill the entire space. With the idea of using wine bottles to create a pathway on the floor as well as on the table, we tested the idea in the space. Practising placing wine bottles, from Anthony, Kay and Shiel (2016). I realised that by creating the outline of a wine bottle, we had effectively ‘[constructed] another architecture within the existing architecture, imposing another arrangement, [or] floor-plan… which confounds [the] everyday hierarchies of place and pattern of movements’ (Pearson, 2010, 36) in TRU, which would restrict the audiences movement, aiding their progression through the piece. Through experimenting with the positioning of the wine bottles, we also discovered that lining them on the edge of the table tunnels the audiences’ vision, directly to the actor sat opposite them, increasing their focus. During the feedback with our module co-ordinator we were also advised to draw more attention to the ‘non spaces’, specifically the toilet, to create an intimate encounter with an audience member. Through further research into one-to-one performances, I discovered Adrian Howells’ Foot Washing for the Sole (2010). This piece included physical contact between the audience member and performer. In addition to the act of washing the participants body, which we believed we could replicate with audience members aiding a performer during our piece by washing their hands, representing soldiers requiring assistance after the war, due to post traumatic stress, linking this interaction in the ‘non space’ to the pieces history. For this section of the piece we aimed to have the performer outside the bathroom rubbing together grapes and dirt, before inviting the audience member to help them wash their hands in the toilet. The grapes and earth were used to represent the early stages of making wine, whilst also relating to the spaces history (with earth’s connotations of soldiers, and war). As a group, we returned to our discussion of how we would guide the audience, in an attempt to finalise our ideas for dialogue in the piece. We found research on Sam Rose’s one-to-one performance Between One and Another describing how ‘[t]ouch brings about an undetatched perception where performer and audience are no longer separated.’ (Zerihan, R, 2009, 68). The idea of having physical contact with the audience, gave us inspiration to have myself constantly accompanying the audience through the piece. We decided to stylise the method of guiding the audience by representing how soldiers were guided after surviving gas attacks (eyes closed with their hands on each other’s shoulders). This led us to re-introduce a previously considered idea, of blindfolding the audience. We aimed for the participant to have an additional sensory experience, noticing the aroma of wine from the bottles before they removed their blindfold. 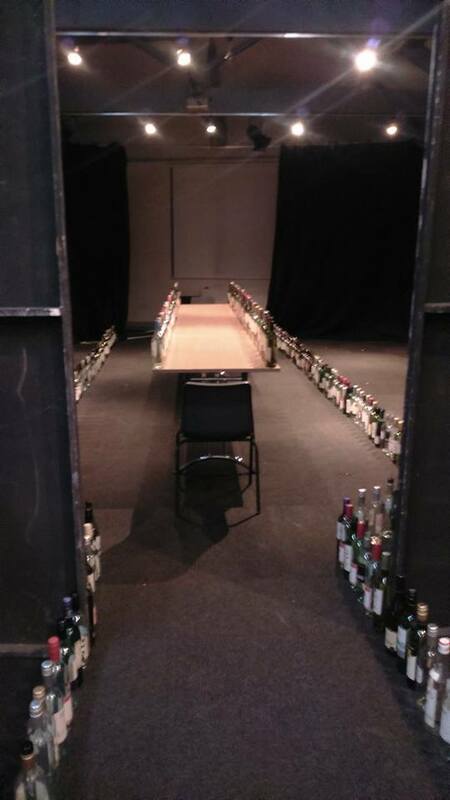 For our final rehearsal we practiced bringing the empty wine bottles into the space, (now at a count of over 400) setting up the installation in an attempt to speed up our ‘get in’ for the performance day. Our final performance lasting from 12:15pm – 5pm, was ultimately quite popular, with almost all of the time slots booked on the day, except two. The first fifteen minute performance slot was pushed back by our group requiring extra time for our set up, which could have been avoided with additional practice of setting up the wine bottles. However, despite one break in our performance (around 3pm) we had a continuous flow of participants, making the piece successful in terms of gaining audience interest. Although this made the piece more challenging with us having less breaks than we assumed, during the five hours. In terms of the content of our piece, each repetition ran at roughly 15 minutes, displaying a consistency in our performance. I believe the focus on the history was made clear through various references to the army training base and Men’s Club in the dialogue used by the performers. Feedback from audience members after the piece had ended suggested a clear relation to the history of the space. Additionally one audience member gave feedback suggesting an admiration for the piece, displaying a specific liking for the visual aesthetics of the installation, as well as my guidance of the audience and clarity of instructions given. I found this feedback particularly helpful in my own reflection of my performance. I believe I could have benefited from rehearsing with audience members prior to the day, allowing myself to be more confident during the piece. If I were to repeat the performance I would have chosen to give the audience noise cancelling headphones in addition to the blindfold, during their journey into the lift. I believe the ambient noise from the theatre, enhanced by the other performances occurring, somewhat distracted the audiences focus and their submersion into the piece. The dialogue regarding the Men’s Club evidence in my opinion could have been less dramatically delivered as I believe this dialogue allowed the performer to adopt a character, which arguably took away from the presentation of information regarding the sites history. I also believe that the dialogue performed could have been refined, as through multiple repetitions of the performance I noticed (minor) alterations from all performers, which if rehearsed further could have arguably been avoided. However, due to the audience’s interactions and their improvised interjections into the piece, some deviations from the scripted dialogue can be seen as reactions to these moments, in order to maintain the progression of the piece. For example the instructions given by the second performer asking the audience to “pick up their glass” or “open their eyes” (Anthony et al., 2016), were prompts in the script which were only included if the participant had not already completed an action which was vital to the piece’s progression. Through creating a site specific piece, opposed to a theatrical production, which required exploring the history of the site, I believe our inspirations and content was enriched. By giving the piece a genuine connection to its location, (rather than performing a text, or devising a piece merely for entertainment purposes). I believe the devising process and exploration of the space was personally more interesting than various work I’ve previously done, due to the idea of our performance giving life to the site’s ‘memories’. Anthony, R. (2016) Research into Forced Entertainment [blog]. 28 February. Available from: http://sitespecific2016mpi.blogs.lincoln.ac.uk/2016/02/28/research-into-forced-entertainment/ [accessed 8 May 2016]. Anthony, R. and Kay, J. (2016) Wine bottle discussion [podcast]. 22 April. Available from, http://sitespecific2016mpi.blogs.lincoln.ac.uk/ [accessed 12 May 2016]. Anthony, R., Kay, J., Shiel, J. (2016) Communion [live performance]. Performed by Robert Anthony, Jacob Kay and Jordan Shiel. Lincoln: Lincoln Drill Hall, 4 May. Corporation Pop (2016) Forced Entertainment. Available from http://www.forcedentertainment.com/notebook-entry/what-is-the-audiences-role-in-a-performance/http://www.forcedentertainment.com/ [accessed 25 February 2016]. Etchells, T. (2012) Audience’s Role in a Performance. Interviewed by D, Walser, 4 January. Howell, A. (2010) Foot Washing for the Sole [live performance]. Performed by Adrian Howell. Belfast: Mountpottinger Presbyterian Church, Unknown. Lincoln Drill Hall (2016) Room Hire. Available from http://www.lincolndrillhall.com/room-hire/room-hiring-facilities/ [accessed 8 May 2016]. Löhr, H. (2014) Last Supper-81, N/A: Performance Space. Available from, https://www.flickr.com/photos/reckless-sleepers/sets/72157633018028724/ [accessed, 28 February 2016]. Pearson, M. (2010) Site-specific performance. Basingstoke: Palgrave Macmillan. Reckless Sleepers (2004) The Last Supper [live performance]. Performed by Reckless Sleepers. Manchester: The Greenroom, Unknown. Rose, S. (2006) Between One and Another [live performance]. Performed by Sam Rose. Unknown. Smith, P. (2010) Mythogeography : a guide to walking sideways. Axminster: Triarchy Press. Zerihan, R (2009) Study room guide on one to one performance. Available from https://blackboard.lincoln.ac.uk/webapps/blackboard/execute/content/file?cmd=view&content_id=_1155911_1&course_id=_87838_1 [accessed 9 May 2016].